The money from a multibillion-dollar federal program to help unemployed and underemployed workers in certain states hold onto their homes failed to reach some of the people who needed the most help, especially in two states hit particularly hard by the recession. In 2010, the U.S. Treasury expanded the Troubled Asset Relief Program (TARP) to include a Hardest Hit Fund (HHF), which has had a pool of nearly $10 billion in relief to provide to homeowners in 18 states (California, Florida, Michigan, Nevada, North Carolina, Ohio, Arizona, Oregon, Rhode Island, South Carolina, Alabama, Georgia, Illinois, Indiana, Kentucky, Mississippi, New Jersey, and Tennessee) and the District of Columbia. While the money comes from the federal coffers, it is administered through state-level housing finance agencies. Homeowners in need apply for HHF help, and if the state approves their application, it then works with a homeowner’s mortgage servicer, who ultimately receives the HHF money in either a lump sum or monthly payments. A majority (70%) of HHF money has already been claimed through these state agencies, but a new report from the Special Inspector General for TARP (SIGTARP) shows that some of these states have been denying access to HHF to homeowners who needed it most. In terms of low-income workers, the report [PDF] found that a total of 85,000 applicants earning less than $30,000 a year were denied access to HHF. 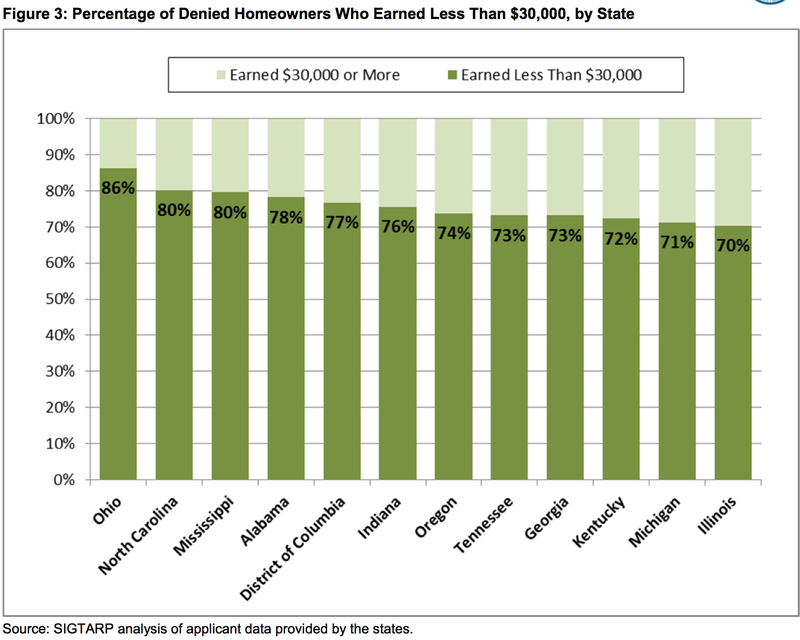 Florida, Michigan, California, and Georgia had the most denials for these low-income homeowners, totaling more than 47,000 rejected applications — accounting for about 55% of all denials for homeowners earning less than $30,000. The SIGTARP report also notes that while low-income homeowners were frequently denied access to HHF, state agencies approved nearly 20,000 applications from homeowners earning more than $70,000 a year, including 6,000 applicants who earned more than $90,000 annually. Taking a closer look at Ohio and Michigan, the report found high rates of denials for low-income HHF applicants in areas near automotive plants that had closed down or where workers were laid off. For example, of the 500 applicants denied near the General Motors plant in Flint, MI, 84% earned below $30,000 annually. Likewise, more than 90% of rejected applicants near shuttered auto parts suppliers in Dayton, OH, were low-income homeowners. While SIGTARP has data showing that certain states and areas seem to have systematically rejected low-income HHF applicants, the report acknowledges that it’s currently difficult to determine if this is deliberate, a result of bureaucracy, or caused by other factors. Mainly, explains the report, it’s because “State agencies’ records provided to SIGTARP were non‐existent, missing or incomplete” on this issue. Some states — Ohio, Nevada, South Carolina, and Arizona — had no information on why any or most of these applicants had been rejected. For some states where this data was available, SIGTARP points sees the need for a “fresh look” at the criteria used to determine HHF eligibility. For example, in Michigan an applicant will be rejected by the state agency if they have received an unemployment check within the previous 12 months, or if their wages had been slashed more than a year earlier. Similarly, different states have different standards for how drastically an applicant’s pay must have been cut in order to be eligible. In Florida and Oregon, a homeowner’s pay must be slashed by at least 10%, while in Michigan it’s 20%, and in other states there is no specific threshold. Michigan also disqualifies an applicant if their mortgage payment is more than 45% of their income. HHF applicants in the state must also wait until their loan is delinquent. As a result, concludes SIGTARP, these overly restrictive Michigan rules may be leaving additional homeowners out in the cold.